This New Chapter is in sections. On reading the seperate sections you'll see how they all connect together like a jigsaw puzzle but, as is so often the case with jigsaws, there is something missing. As the very last section explains it seems that there is no satisfactory solution to the Missing Piece and here perhaps the reader might be able, through their initiative or experience to offer some sugestions as to how a satisfactory conclusion can be reached. 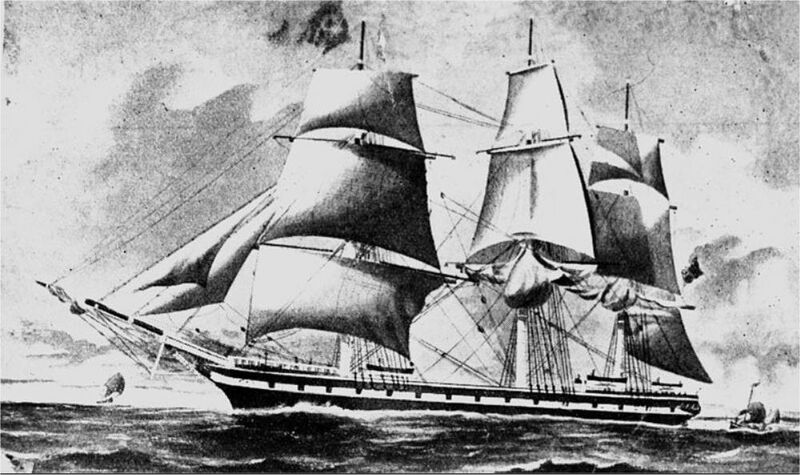 The three masted Clipper DUNBAR (see image) was one of a fleet of ships owned by Mr Duncan Dunbar, of Limehouse, London. She was built in 1852 with a registered 1321 tonnage but before she could be used for her designed purpose, to speedily serve the Australian Trade run, DUNBAR was requisitioned by the Royal Navy for Troopship Duties in connection with the Crimean War. It was not until 1856 that she performed her maiden run to Australia. The facilities on board catered for first class, and to a limited degree second class passengers and significant cargo space.The second voyage to Australia made by the "DUNBAR" was under the Captaincy of James Green and departed Gravesend Docks on the 24th May 1857, proceeding to Plymouth, Devon. On the 30th of that month (some accounts state the 31st) she departed Plymouth for Sydney, Australia. She carried, according to most reports, 63 passengers and 59 crew and a substantial mixed cargo valued at some �70,000. Amongst this cargo were maybe two consignments of "flat packed" Garton & Jarvis Stoves including amongst other models 18 'Medium Stoves' and 26 'Cottage Stoves' some destined for, we think, the Colonial Stores, Sydney, others for transhipment further afield, including New Zealand destinations. 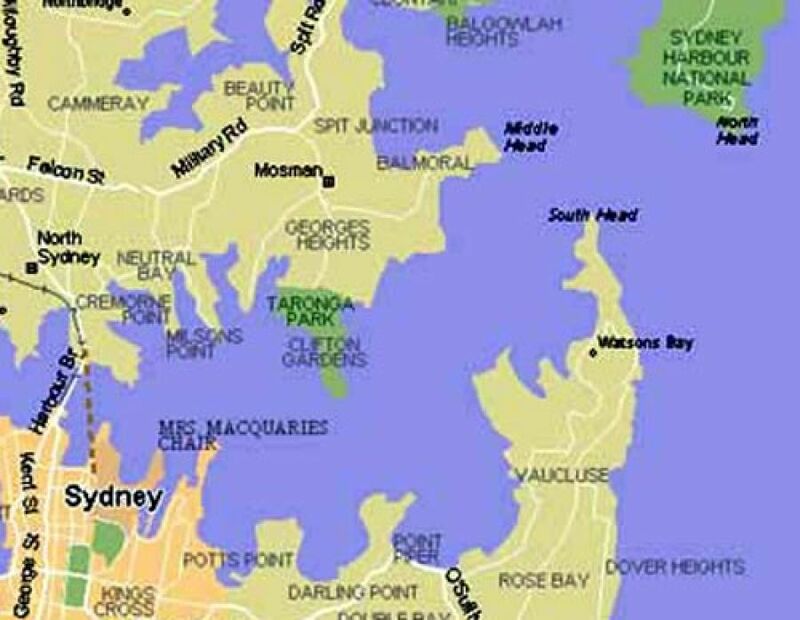 "Shortly before midnight on the 20th August 1857 with a gale rising and bad visibility the DUNBAR approached, from the South, the entrance to Sydney Harbour. According to the entry in WIKIPEDIA (other accounts are similar) Captain Green either mistakenly believed he had passed the harbour's Southern Headland or, incorrectly, took a small gap in the coastline known as "The Gap" to be the port's entrance and consequently, despite evidence that the second mate on the foredeck had cried out "breakers ahead" and Captain Green gave the order "Port your helm" it was too late and the ship was driven broadside onto the 160 or more foot high cliffs to the south of South Head, midway between Macquarie Lighthouse and The Gap. Almost immediately the ship began to break up." Out of the total persons on board only one person survived, a crew member James Johnson, who managed to scramble and climb part the way up the cliff face. He was not rescued until the 22nd August. It was not until morning of the 21st did the enormity of the events that occurred the previous night begin to dawn on the community of Sydney. With the washing up on shore of mailbags and other debris were they able to identify the ship involved and thousands over the days ahead were drawn to the scene and watch the recovery of bodies and the salvage of some of the cargo. The victims of the disaster were buried in Camperdown Cemetery; a memorial to the event was erected at The Gap, Watson's Bay. The anchor at this site was raised in 1907 and the plaque unveiled in 1930. 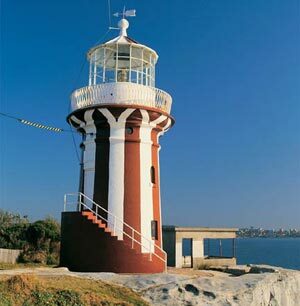 The Hornby Lighthouse (see image) was built at South Head in 1858, ensuring a safer entrance to the Harbour. Both the Great Exhibition of 1851 and the subsequent Paris Universal Exhibition of 1855 had great beneficial effect on Garton & Jarvis's sale of stoves and ranges. 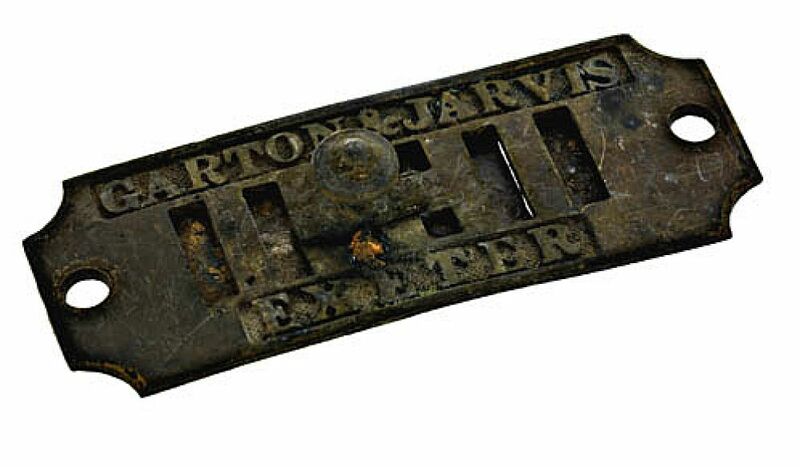 Not only within the Britain but also abroad, particularly in the Colonies, as enterprising individuals sought to import Garton & Jarvis's products. Word was spreading as to their quality, assisted no doubt by the fact that Prince Albert had become a customer. One particular individual by the name of William McDonnell, whom we believe to have had connections in or with the Colonial Stores in Sydney, was a particularly enterprising individual. 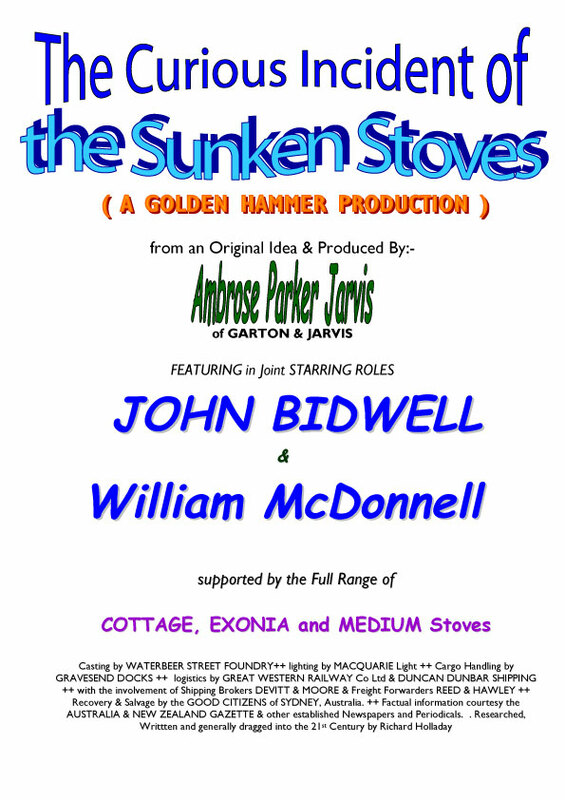 Not impressed with the cheap imported "flimsy" American Stoves (a view many in Australia and New Zealand shared) he capitalised on his family connection with a Mr John Bidwell of St Thomas, Exeter - his Father in Law. John Bidwell apparently worked for the Drainage & Enclosure Company of London & 9 Bedford Circus, Exeter who in turn, either through the Company or personally, had contacts with Garton & Jarvis and was all for oiling the wheels of his enterprising Son in Law's venture to import Garton & Jarvis's products, particularly their stoves.Handwritten letters saved by my father are able to verify this McDonnell / Bidwell arrangement and in one particular letter dated the 8th April 1856 William McDonnell was not shy in promoting his contacts in "Geelong, Melbourne, Adelaide, Port Fairy, Aukland Wellington and Canterbury in New Zealand and Hobart Town and Launceston in, as he knew it then to be, Van Dieman's Land (Tasmania)". It was obviously all or nothing with him but one must bear in mind that mail from that part of the globe took 11 or more weeks to reach the UK so it was essential to include as much as possible in one's letters that was relevant! The Company's Stove Record Book, that still exists, covers a period from 1850 to 1870 and careful examination of the records shows the orders placed with the Company by the McDonnell / Bidwell Enterprise between 1857 and 1862 amount in total to almost 200 stoves, a third of which were of the COTTAGE Model and two thirds the MEDIUM Stove. According to our records stoves to Australia and New Zealand were shipped roughly once a month and we can see that the shipment for May 1857 comprised two consignments. The first was that of Reed & Hawley, Shipping Agents with a shipment of 6 Cottage and 6 Medium Stoves. The second consignment was that of the Mc Donnell / Bidwell Enterprise and consisted of 12 Medium and 20 Cottage Stoves, the destination in the Order Book is shown simply as "Australia". Searching, as I do on occasions, the internet for any reference to Garton & King or Garton & Jarvis I sometimes get lucky! About a year ago I came across an article from the "Invaluable Auctions" Website dated 2001 - I have copied the image. On investigation I discovered that the item, No 12 - A Ventilator by Garton & Jarvis, Exeter, was part of Lot 14 which comprised a collection of Marine Artifacts placed for auction by an as yet unknown collector. I have deduced that this Auction was held sometime in 2001 - unfortunately Sotheby's Australia are somewhat reluctant (as of the time of writing) to answer any of my queries but should they decide to be helpful I will alter this section and include any relevant information that they might choose give.This Sotheby's Auction of 2001 should not be confused with a far more significant event involving what is known as The Gillies Collection.To quote from the Australian Institute for Maritime Archaeology Newsletter dated the 1st February 1995 (Vol: 14 No: 1) under the heading Australian National Maritime Museum:-" For sometime the Museum has known of the collection held by local sports diver John Gillies which he recovered from the wreck (Dunbar) in the 1950s & 1960s. .......In August 1994 the Department of Planning granted Mr Gillies a permit to dispose of his collection at Auction ...... soon after Sotheby's announced that the Dunbar Material would be auctioned in the first week of December. "It seems that after the Museum was approached by numerous individuals, councils, and government departments with requests that the A.N.M.M. should purchase the collection the Museum found itself in a bit of a quandry, not least because it had insufficient funds (Don't we all know that problem!!) but also there cropped up the ethical concerns it faced with purchasing artifacts privately acquired from a shipwreck. They were also concerned as to whether any purchaser of the collection would abide by the conditions attached to the Permit authorising the auction that stipulated that there were to be conditions attached to the sale, one of which was that the collection should remain in Australia.The John Gillies Collection contained over 5,000 Objects including, apart from Ironmongery, Coins, Jewellery, Cutlery, Personal Items including Rings and Dental Plates etc etc. Not wishing to be flippant but it seems that after something of a "Whip Round" by the Museum thay were able to secure the complete collection after having negotiated with John Gillies who agreed to accept an offer markedly less than the original estimates. The collection was withdrawn from Auction. Some of the artifacts proved to be beyond conservation treatment but those that could correctly be conserved and registered would have cost around $170,000 - we are talking 1994 costs - this amount was in addition to the settlement figure. Parts of this collection went on display in the Age of Sail exhibition at the museum. Over a period of years thousands of Dunbar artefacts have undergone conservation, registration and curatorial research, and have provided the focus for activities at the museum that have commemorated the 150th anniversary of the wrecking of the Dunbar. I believe beyond reasonable doubt that some or all of the Garton & Jarvis Ventilator Grilles that the A.N.M.M. on their own admission hold in their collection were part of that John Gillies Collection. Amazingly the Museum admit to having in excess of TEN Grilles - see image - they are possibly no bigger than about 4" x 2" judging by the size of later versions affixed to stoves within Devon. So there we have most of the Jigsaw. We have evidence of two shipments; we know what the products were, where they were destined, who had placed the order and when. We have documentation describing the type of stoves ordered and their cost and we know at which Port they were laden and on which vessel. 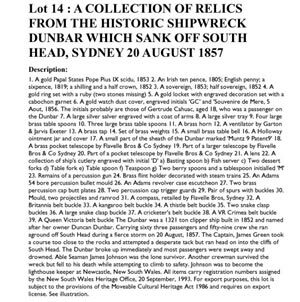 We know when the vessel sailed and when it was wrecked and we know of at least two collections of artifacts, one which Definitely included a Grille from the Dunbar, and the other that ended up in the vaults of the Australian National Maritime Museum in Sydney. We know that the Museum holds at least 10 grilles. So far we only have a photographic example of a grille from the Dunbar. A simplistic view might be "have a word with the Museum and they'll send you a spare one - they have plenty examples!" This is where Red Tape takes to the stage and we all know how obstructive Red Tape can be! I have made this simplistic request to a "Department" and to the Museum but of course, you guessed right, the answer was NO. Its the legislation that prevents it, or maybe the principal, or maybe someone has lost the scissors that they use to cut the Red Tape when it suits! Exeter's Royal Albert Memorial Museum have, I am assured, approached the A.N.M.M in a Museum to Museum approach. Quite how the request was put I am not privvy to and, many months down the line, I am unaware that there has even been a response. The R.A.M.M. is, after all, somewhat involved in its revamp. It is not heartening to hear from both Museums that, as a general rule, only approximately 5% of each Museums' collection is ever on display at any one time so maybe a transfer of one Grille from an Australian Shoe Box to an English Shoe Box is, even if feasible, not a progressive step. So, the example of a Dunbar Grille in Devon seems very unlikely and this is the missing piece in our Garton & Jarvis DUNBAR JIGSAW! There are thoughts that cross my mind and maybe some appropriately experienced individual may offer advise or take up The Cause. 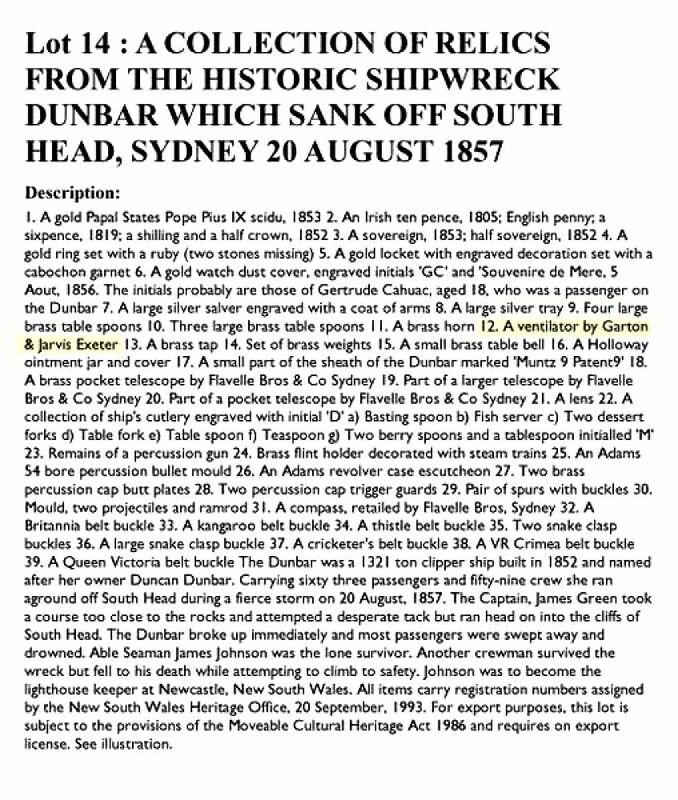 The Dunbars cargo was, by all accounts, only partially insured - �70,000 cover in 1857 according to one newspaper. One presumes that there would have been payment to Garton & Jarvis before dispatch to Gravesend Docks. But what if there wasn't? Depositing the cargo on the sea bed at Sydney would not constitute delivery and therefore someone wants their Money back - or another consignment of stoves - a quick look through the Order Book does not seem to indicate this. Garton & Jarvis would not be aware of the wreck for many months and even when they did what stance would they take? In the meantime in Sydney it is unlikely that any complete undamaged saleable stoves might have been retrieved from the wreck site. How did the ownership of the consignments pass over the passage of time from Manufacturer (Garton & Jarvis) in 1857 to Australian Authorities and ultimately to the A.N.M.M. (on or before 1994) in the case of the 10 grilles? - at what stage did Garton & Jarvis undisputably relinquish their ownership of all or part of the two consignments - or maybe they never did if there wasn't sufficient insurance to claim from?? Did ownership of the parts of stoves (and for that matter many of the relics recovered) pass to the retrieving Scuba Diver back in the 50s and 60s before legislation was passed in the form of The Historic Shipwrecks Act (1976). This link will take you to a short video newsreel clip entitled "Divers recover relics of wrecked ship". Filmed by British Pathe in 1963, and shows (with a narration) divers working on the wreck of the Dunbar. I am grateful to Jack Cullen, Media Officer of British Pathe Ltd. Feedback on this subject is appreciated but particularly from Barrack Room, or should I say Dockside Lawyers!! Contact details are here. If you belong to a Club or Society in the Exeter Area and would like me to give a talk on the History of Garton & King Ltd then please contact me - Contact details are here.